(Photo credit: Jordan Hardy/Premier Boxing Champions) BIRMINGHAM, AL. 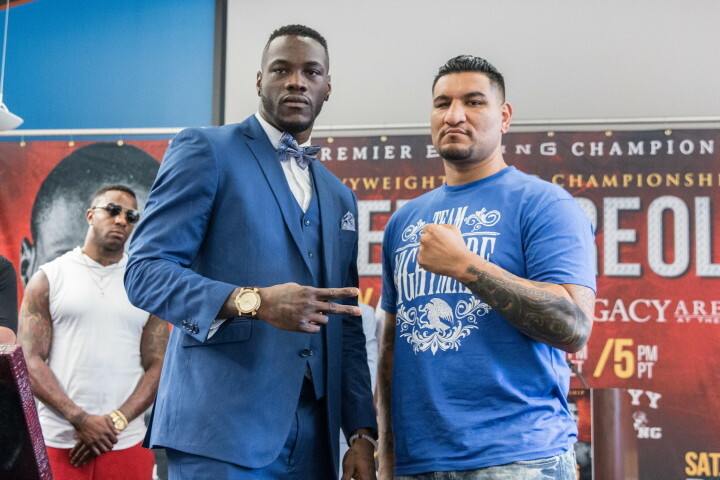 (July 14, 2016) – Heavyweight world champion Deontay “The Bronze Bomber” Wilder and two-time title challenger Chris “The Nightmare” Arreola went face-to-face Thursday at the final press conference before they headline Premier Boxing Champions on FOX and FOX Deportes this Saturday, July 16 from Legacy Arena at the BJCC in Birmingham, Alabama. In attendance at the press conference and featured in televised action beginning at 8 p.m. ET/5 p.m. PT were undefeated Sammy “The Sergeant” Vasquez Jr. and Olympic gold medalist Felix Diaz, who square off in a 10-round welterweight bout, plus rising star Erickson “Hammer” Lubin and Mexico’s Ivan Montero, who meet in a super welterweight attraction. The televised action will switch over to FS1 and FOX Deportes immediately following the conclusion of the FOX telecast with action headlined by undefeated welterweight Jamal James battling exciting contender Wale Omotoso. Additional action on FS1 and FOX Deportes features former world champion Vic Darchinyan and undefeated heavyweight Gerald Washington in separate bouts. association with TGB Promotions and Bruno Event Team, start at only $20 and are on sale now. For tickets please visit www.alabamatitlefight.com and www.ticketmaster.com. Fighters spoke to media at the BJCC’s Arena Club inside the same venue that will host a stacked night of fights on Saturday night. “I’ve wanted to hit somebody since May. I got teased but now it’s time. And I get to do it at home. There’s no better place to do it. “We’ve had a few guys that we could have chosen, but there were certain guys we didn’t want to give a short notice opportunity. We needed a certain type of fighter for this job. “We need someone who will fight with their heart and take this opportunity and make the most of it. Does he deserve the title shot? No he doesn’t. He knows it. But is Chris Arreola the perfect guy for this fight? Of course he is. “Chris is lucky to get a third chance at a title. There’s a lot of prospects who would love to fight him just to get a chance to fight for this belt. We needed a special person for this situation and I blessed Chris Arreola with the opportunity. “It’s time to fight. He’s ‘The Nightmare’ and I’m a knockout artist. What makes me special is the way I knock people out. Go look at the people I’ve knocked out and see what I’ve given them. “This is going to be another story for me to write in the history books. I can feel it. It’s going to be a great show. Don’t miss it. “I’m ready for this fight. I’m more ready than I’ve ever been. I’m hungry. This isn’t a cakewalk. I respect Deontay, that’s why I trained for you. Come fight time, there’s no respect, it’s time to fight. “One thing no one can question about me is my heart. I’m going to come at him but be smart. My goal is to take home that title and make history. “Me and Felix Diaz are both coming to bring it. It’s going to be a tough fight for him and myself. People have to watch this fight. To me he’s undefeated and I’m coming in undefeated. We’re putting it all on the line in this fight. “Felix and I have worked together and we’re friends, but this is business. He knows that I’m going to bring it like I do every fight. It’s a great opportunity to be showcased on this card. “If you feel that you’re the best in your weight division, then it doesn’t matter who they put in front of you. My opponent doesn’t matter; we’re going to get the job done. I have to fight quality opponents to be able to step up to the next guy. “Felix Diaz is a great competitor and he’s a very tough fighter. He has a tremendous amount of talent and he never stops coming, just like I do. “I’m a pressure fighter. I like to show the crowd how I get down. I’m an undefeated fighter and I will remain that way Saturday night. I’m here to take care of business. “I need wins like this to get fights with Danny Garcia and Keith Thurman and I need to do it decisively. “If I can get this win I definitely want Danny Garcia. He’s a Philadelphia guy. I’m from Pittsburgh, it’d be a fun matchup. We’re both marketable guys and I think it’d be a huge fight. “I want to thank everyone who is here today. Everything is ready to go. We’ve had a great training camp leading up to this fight. “I know that Sammy is a very good fighter. We’ve been stablemates before, but this is business. I’m going to do what I have to do to be victorious on Saturday. “This is a great opportunity on a big card. I’m here to showcase my talent and show why I’m one of the best 154-pound fighters in the world. “This is a stepping stone for me. I know this is a tough Mexican who will be a great opponent. I just took care of business early a few weeks ago in Chicago and I’m looking to do the same thing Saturday. I’m here to steal the show. “We always stay ready in the gym. It’s always training camp. I’m at a point in my career where I have to be ready at all times. When the call comes, I’m ready. “We’re working on some things that we wanted to tighten up from the last fight and I can’t wait to show everybody my improvements. “Wale has been in there with some great competitors. We had to make sure everything is tightened up because he’s a strong guy. He has a good knockout ratio so you have to watch out for power punches. “A lot of guys I fight are shorter than me. I’m one of the tallest welterweights in the game. A lot of guys have to fight me the same way, so we know what to expect. Our defense is tight and I’m sitting down on my punches more than ever. “It’s a blessing to be on a card like this. I was very excited when I got the call. Deontay Wilder is a heavyweight champion and it’s a stacked card. It’s a great honor. I’m happy to keep stepping up in competition and in platform. “I’m looking to go out there and take care of my business. We’ve worked hard in training camp and we’re prepared for anything. “I’m going to use my speed and athleticism. The goal is to execute my game plan. Hopefully I can stay busy, land something big and get him out of there. “My grandfather is actually from Alabama so I have roots here. It’s very exciting to be on an undercard for Deontay Wilder defending the heavyweight world title. I have to perform and be exciting so that I one day I can be fighting a great champ like Deontay Wilder.